Your wedding day is one of the most important days of your life. We get that. Simple. Memorable. Stress-Free. Guaranteed! At JC Dance Co., we would be honoured to teach you and your fiancé how to dance together as you prepare for your wedding. 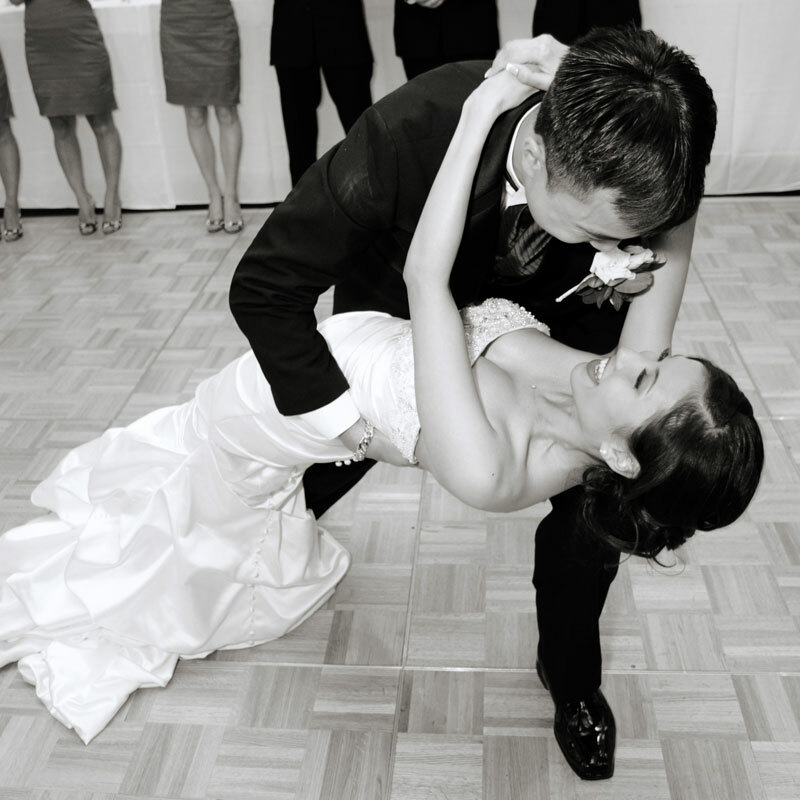 You may be surprised how easy and fun wedding first dance lessons can really be! We can teach a variety of dances from Waltz all the way to Jive and Salsa. The most important thing is that the dance suits the both of you. We always start simple and slowly build the number of steps as time and ambition allow us. Ultimately, you have the final say on what’s danced, we’re just here to teach you all the options in the simplest and easiest way. Below is a short list of options that can help you prepare for your special day. They range from simple to sensational, and depend partly on how much time you have before your wedding and what type of dance you want to do. Contact JC Dance Co. today and take your first steps together, on and off the dance floor to a romantic and special life in each other’s arms! Left your First Dance to the last minute? No problem! Are you looking at your calendar and realizing that you have run out of time for dance lessons? No problem! Come in and spend just an hour and a half with us to put your mind at ease. You have enough on your plate right now, so let us help take the stress out of your wedding dance. Say goodbye to the “grade 8 shuffle” and say hello to simple confidence! Hey, don’t worry! It’s never too late. We’ve been contacted just 5 days before a wedding… and yup, they did just fine. In case of emergency, we’re here for you! Are you super nervous about your first dance? Or are you a little more adventurous and want to impress everyone at your wedding? These packages get you dancing together to the song of your choice. You’ll have a great time together on the dance floor as you perform with confidence. We’ll create anything from a beautiful slow waltz to a funky disco number. Simple to superiffic. It’s all up to you. This will be the first dance that you’ve always dreamed of doing at your wedding. After your first wedding dance, it is customary for the bride and groom to dance with their parents. Wouldn’t it be great if you could actually dance properly with your parents as well? Make the dance not only special for yourselves, but for your parents too. One of the great things about a wedding is being able to party with all your closest family and friends. Why not include them in your first dance, entertaining yourselves and surprising the audience too! We start by teaching the wedding couple a short solo dance, and then bring in the entire wedding party to shake things up. Just imagine the stories you, your bridesmaids and your groomsmen will be able to tell after your wedding! If the packages shown here aren’t quite what you were after, we can offer you a customized solution exactly suited to your vision. We’re here to help, so let’s get started right now by answering some of the questions that may be on your mind. Why should I take lessons for my Wedding First Dance? For most wedding receptions, there is a transition from the formal sit-down events of the evening, such as the dinner and speeches, to the more informal dance party at the end of the evening. It is customary for you, the wedding couple, to be the first couple on the dance floor. Although there are no rules about how this first dance is done, if you are not used to dancing together, especially to your special song, this first dance can be a source of anxiety and stress. Wedding first dance lessons will give you the experience and confidence to dance your first dance without stress, so that you and your fiancé can truly enjoy your time together on the dance floor. Your dance can be anything from super simple, involving a few figures done through lead and follow, to more complex, involving a specifically choreographed number that wows everyone at the reception. A good dance teacher will be able to help you with whatever you are looking for. I want to take dance lessons, but my fiancé is against the idea. What can I do? The idea of dance lessons is often a very foreign idea to many people here in Vancouver. It’s just not part of our culture. Many people look at TV shows such as ‘Dancing With the Stars’ or ‘So You Think You Can Dance’ and say that there’s no way they would want to do that. However, dance lessons for your wedding dance don’t have to be that intense; they can be totally different. The dance floor is still a traditional place where the man has the opportunity to take full responsibility in leading his lady. Therefore, dance lessons are very much about a man learning how to lead his lady and for a lady to follow the indications given by her man. All the fancy steps, extra arm styling and emotional gestures are just optional additions to an otherwise very technical (yet easily learned) skill of leading and following. Try suggesting to your fiance that you can come to the ballroom for a free consultation. You’ll be able to meet with one of the teachers, chat about your ideas (and worries) for your wedding dance and most of all get more comfortable with the atmosphere of the ballroom. All that for FREE! Trying to guess how many dance lessons you need is a bit like asking how long will it take to learn how to swim. It all depends on how your body learns and how open your mind is to new ideas. Some people learn faster than others. Some have certain kinds of background experiences that make it easier to catch on to key things. Some have very busy lives making it harder to practice or even focus on what they’re learning. And goals are also part of the equation. Do you just want to learn enough for a couple simple steps, or are you planning to totally kill it and become a YouTube sensation? In short, everyone is different. The number of lessons you need will vary greatly from one person to the next. What counts is your desire to learn and your willingness to go forward and give it a try. We make it fun because learning is easier when you’re having a good time. With all that said, our most popular packages are the 4 and 7 lesson package as described above. They will give you the right amount of time to be confident dancing a simple or slightly more complicated dance. Like with everything, it’s ultimately up to you both to decide what fits you best, but we can guarantee that you’ll be better dancers after your lessons than before your started! How do I know if our song is a good one to dance to? We believe your wedding dance should be a unique and authentic reflection of you and your fiance. Therefore we will use our skills to teach you to dance to the song of your choice, not your dance teacher’s song of choice. If you have a selection of equally special songs, we can help you decide what will work best. We can either do this at your first lesson or we can schedule a free consult at the ballroom before your lessons start to answer all your questions in person. Keep in mind that your song selection doesn’t have to be slow and romantic. We’ve worked with many Vancouver couples who wanted faster, upbeat and sometimes downright silly songs to dance to. The Broadway Ballroom has free underground parking for all dance students attending a class. The entrance is through the back alley behind the ballroom. Get a parking pass card from the receptionist on the 2nd floor and place the pass on the dash of your car. Check out our handy video to the left on how to get here and where you can park! Need some great entertainment for your wedding? Our Performance Team loves to be part of unique and memorable weddings. These dancers have entertained Brides, Grooms and their guests with energetic and fun numbers, adding that extra special something to an already incredible evening. Their elegant Waltz-Hip Hop, cheeky Country-Cha Cha, flamboyant Bollywood-Samba and comedic Jive-Lindy Hop shows have all been performed at various Vancouver weddings with thunderous applause. Contact us for details. Using DreamGroup to plan your wedding? Customers of DreamGroup Productions earn special discounts on First Dance packages. Ask us for details!